Preview OCT. 23. 2015 / 7-9pm. 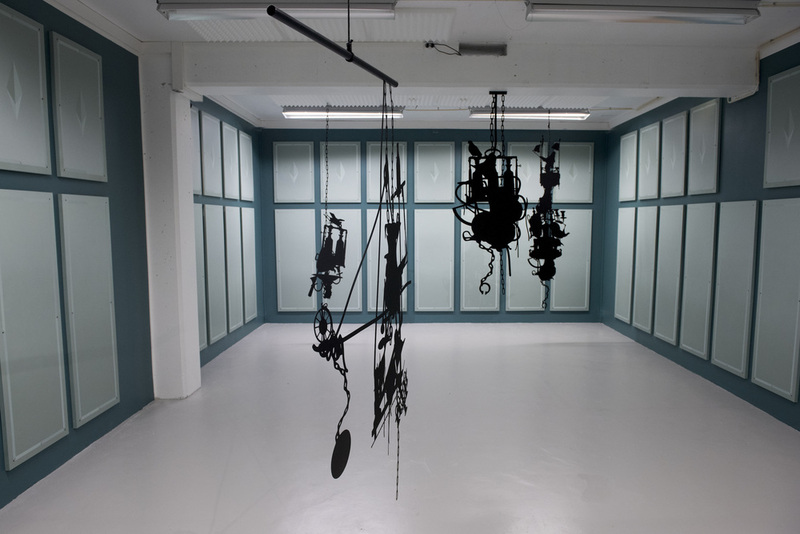 The chains used for the installation of the silhouettes represent the proverb “a chain is no stronger than its weakest link”, referring to the very fact that the mystique and true abilities of Piper were unveiled when James discovered Piper’s true source of information. There are no pre-drawn conclusions or blueprints for Morell’s project. You have to come and take a look. The artist can’t promise you anything. Lars Morell (Born 1980, Kristiansand) studied at National Academy of Fine Art in Oslo (2001-05). Recent exhibitions include Palais De Tokyo, Paris; Muhka Antwerpen, Foundation D´ enterprise Ricard, Paris; Jeu De Paume, Paris; Galerie Wentrup, Berlin; Choi & Lager, Køln; Cinnamon, Rotterdam and Kristiansnd Kunsthall, Kristiansand. He has received grants and awards from Pollock-Krasner Foundation and Deutche Börse Residency Program, amongst other, and is represented in several private and public collections.